In each 84 page monthly issue of Australian Artist magazine we take you inside the studios of Australian and New Zealand's best artists. They tell you the thought processes behind their creative methods and reveal their painting techniques. You get to look over the shoulders of artists from all parts of the country to see what they are painting. Beginners can take heart in reading that even the most accomplished professional artists are never satisfied. If you are an artist with intermediate ability, you'll be able to compare your skills with artists all over the country, where they are also satisfying their creative urges. And for the professional artist — what's in it for you? This national magazine offers a unique opportunity to see your work exposed to a country-wide audience. It would be hard to find a medium that has the capacity to so comprehensively showcase and publicise your work than Australian Artist magazine. Feature articles where leading artists invite you into their studios and demonstrate their working methods from start to finish. Master Painters Showcase shows outstanding artists who reveal what inspired them to paint the work shown and divulge the working process involved. Prize Money totals $1,750 for every competition. Here's where readers can buy the best art instruction books and videos - all at low, reader benefit prices. No membership is required. Every book carries a No Risk 10-day Money Back Guarantee. Click on our range of books, or Book of the Month buttons to see more. 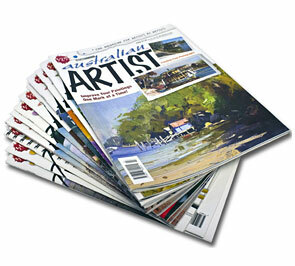 Australian Artist magazine is one of the world's largest organizer of painting vacations for practicing artists. The best art tutors, the best destinations and the best experience. Read all about our latest art vacation program in the pages of the magazine, or visit http://www.paintingworkshops.net.